A merchant rents an unused space on a very short-term basis (i.e., a few days to a few months). This temporary location targets high-traffic areas frequented by pedestrian shoppers. The merchant makes as many sales as possible for the duration of the rental agreement. Like that, the pop-up shop disappears — only to be replaced by some new merchant. Yet, why would any retailer go through the trouble and cost of setting up a temporary storefront? Below are six of the biggest benefits driving the new pop-up shop craze. The most obvious benefit is that you now have one additional storefront through which to sell merchandise. Even though it’s on a short-term basis, you’re almost guaranteed to generate more sales than you would without that pop-up shop in place. This is especially true if your flagship store is in a strip mall or some other location that doesn’t normally receive a lot of foot traffic. Once you’re set up, you can host an official “grand opening” party for your store. Given the fleeting nature of pop-up shops, there’s a sense of urgency and novelty. This can help create a ton of exciting buzz — especially if your last launch party was many years ago. Pop-up shops allow you to test the waters — with minimal risk. For example, you can set up different displays in different locations to gauge which layouts produce the highest conversions. Then, you choose the winning configuration for your flagship store. This A/B testing can also be applied to product launches, locations and even sales teams. Pop-up shops enable you to safely try new ideas without dramatically altering your brand's core identity. If you run a brick-and-mortar store, you likely interface with shoppers all day. As already mentioned, pop-up shops can help create even more customer touchpoints. If you’re an e-merchant, though, there’s a good chance you’ve never met a customer face to face. 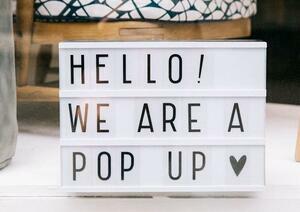 Setting up a pop-up shop allows you to finally bring some of your online relationships into the real world. Pop-up shops are perfect for demonstrations, workshops and tutorials. In fact, many big-name retailers now have permanent pop-up shops that don’t sell inventory at all. For example, Nordstrom recently introduced dedicated locations that exist for the sole purpose of providing styling tips and in-house makeovers. As a merchant, you could use a pop-up shop in similar ways — whether you sell power tools, electronic gadgets or musical instruments. With a temporary store, you’re able to educate customers about how to use your products and services. Better still, pop-up shops can help you collect valuable feedback about your customers’ pain points and trouble spots. Insights like these are priceless. Launching a pop-up shop is a lot cheaper than you probably realize. That’s because you don’t have to worry about lengthy contracts, utility setup, permits or inspections. Everything you need is already in place. Plus, because many pop-up shops exist for the sole purpose of hosting temporary storefronts, they’re designed to make moving in (and out) as easy as possible. If you’re a new merchant, this allows you to test different spots throughout the city — before committing to a more permanent location. As an established retailer, you can use pop-up shops to test potential locations for future satellite stores. Most pop-up shops are ready-made environments that have everything you need. E-commerce merchants usually have payment gateways that don’t work in the offline world. Brick-and-mortar retailers often have heavy, standalone credit card terminals that can’t easily be moved to new locations. This makes accepting credit card payments on the go a real challenge, but that’s where BluePay can help. We offer a wide range of mobile credit card payment options that allow you to generate sales anywhere and everywhere your customers are. Instead of lugging around clunky card readers, our mobile payment solutions allow you to convert your store’s smartphones and tablets into portable credit card terminals. A small card reader that pairs with your mobile device. A Wi-Fi connection (which most pop-up shops have) or data service. As with all of our solutions, these mobile credit card payments benefit from the latest in PCI-compliant data security. With BluePay, you don’t have to worry about fraud, abuse or breaches — even when your sales teams are in the field. Thanks to our many software integrations, all the sales generated at your pop-up stores are instantly reflected in the accounting and CRM tools you’re already using. You can make better-informed decisions about conversions and A/B tests as these sales happen in real time. To learn more about accepting mobile payments — whether at a pop-up shop or at your primary store — schedule a free consultation with our merchant services team today.